Turkey’s prime minister said Saturday he would be receptive to the possibility of allowing American troops to withdraw from Iraq across Turkish territory, if the United States asks for permission. “Regarding the transfer of troops, soldiers, we are positive on that issue,” said Recep Tayyip Erdogan, speaking through an interpreter. In an exclusive interview with CNN at the headquarters of his Justice and Development Party, Erdogan indicated he had not yet received an official request from his American ally for permission to move troops across Turkish soil. In March 2003, the Turkish parliament voted against allowing a U.S. invasion force to cross Turkey’s border to Iraq. At the time, Erdogan’s political party commanded a majority of seats in parliament. The decision upset Pentagon plans to open a northern front in the push to overthrow Iraq’s Saddam Hussein regime, forcing the U.S. military to rely on a single-pronged invasion force from Kuwait. It also struck a blow to the close U.S.-Turkish relationship, which grew increasingly tense during the U.S. occupation of Iraq — widely unpopular in Turkey. American popularity dropped to single digits in Turkish opinion polls during the Bush administration. But Erdogan said President Obama has hit the right tone since his election to office. “His steps for Guantanamo Bay … were very positively received in Turkey,” Erdogan said, adding that he also welcomed Obama’s recent message to Iran offering congratulations on the Persian New Year. Erdogan drew a comparison between himself and the American leader, saying they shared similar humble roots. 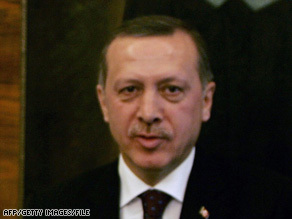 Erdogan is expected to host Obama next month, when the U.S. president is scheduled to make a two-day visit to Turkey.